As Second Harvest Heartland continually works to increase the amount of fresh produce available for distribution to local food shelves, soup kitchens and other agency partner programs in our region, partnerships with organizations like the Minnesota Project become even more crucial. Fruits of the City, a program of the Minnesota Project, works to capture fresh fruit from local orchards and nearby backyards that would otherwise go unharvested. For five years, from August through October, Fruits of the City has held gleaning events using trained volunteers to pick and box apples from local, private and commercial orchards. This year, 25 different gleaning events were held at 17 different locations in partnership with Fruits of the City, resulting in more than 107,000 pounds of apples being harvested and distributed through Second Harvest Heartland to our agency partner programs. This is over three quarters of the apples received during this year's gleaning season! By working together with partners like Fruits of the City, we're pioneering new ways to collect and distribute the more than 200 million pounds of crops in Minnesota that are otherwise left unharvested or unsold each year. 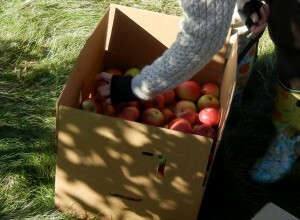 Thank you to the Minnesota Project's Fruits of the City program, volunteers and donors that helped make this year's apple gleaning season such a success. For more information about Second Harvest Heartland's programs providing locally grown, farm-fresh food, visit 2harvest.org.